During the late 1800s and early 1900s millions of people immigrated to the United States for land, food, freedom, and opportunity. Have your students write a detailed paragraph about what they learned about immigration to America by utilizing this Step Up Paragraph Packet. 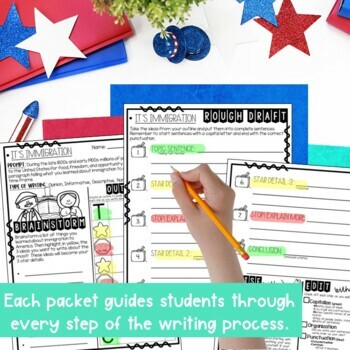 Our paragraph packets are designed to guide primary students through each step of the writing process while implementing the Step-Up to Writing method to help them create a well-developed paragraph that includes a topic sentences, 3 detail sentences with further explanation, and a conclusion sentence. Students will also be guided through the revision and editing process and participate in a peer conference for further feedback. 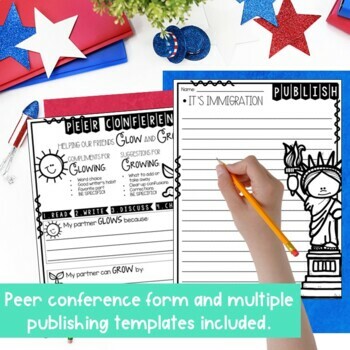 Our paragraph packets are perfect for younger students who need more guidance in whole or small group settings, while their structure helps support more independent writers as well. The format of your paragraph packets will remain the same each month so that students will continue to grow more independent in their writing through familiarity with the layout. Please download our FREE PROMPT: It's Time to Be Kind for a sample of how our Paragraph Packets are laid out. 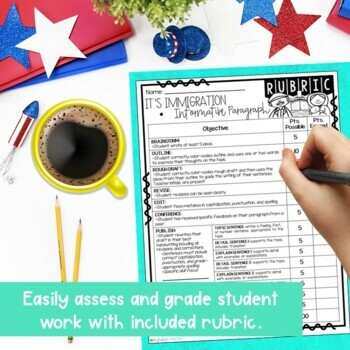 All 10 months included for over 60 prompts plus an EDITABLE FILE to accommodate your personal classroom needs! Upon purchase, please consider leaving us feedback. It is always appreciated! Click the star at the top of the page if you would like to be notified of our new products and sales. Follow us on Instagram and Facebook @stylishin2ndgrade for updates on our latest products, ideas, freebies, and fun!